HONG KONG, May 16, 2018 - (ACN Newswire) - A team led by Dr Edmond Ma Dik-lung, Associate Professor of the Department of Chemistry of Hong Kong Baptist University (HKBU) has developed the world's first iridium(III)-based probes for imaging dopamine receptors in living cells. The discovery has enhanced the understanding of dopamine receptors in carcinogenesis, and the findings can be potentially developed as a novel early cancer detection technology. The study was published in the inside front cover of Chemical Science, the flagship journal of the Royal Society of Chemistry. Dopamine is an important neurotransmitter in the central nervous system of the human body and plays important roles in motivation, cognition and motor control. While dopamine receptors have long been implicated in neurodegenerative diseases, such as Parkinson's disease, recent evidence has linked dopamine receptors also with various cancers, including lung, breast and colon cancers. Traditional detection methods for dopamine receptors include the enzyme-linked immunosorbent assay (ELISA). However, such methods suffer from high cost, incompatibility with living systems, and are not suitable for the real-time study of the biological role of dopamine receptors. The metal-based probes developed by the team are able to selectively bind to dopamine receptors on lung cancer cells, "lighting up" the cells and making them visible to the naked eye. The probes enable the monitoring and tracking of dopamine receptors in living cells in a real-time and in a non-invasive fashion. Moreover, the experiment results demonstrated that the imaging colour intensity was correlates with the expression levels of dopamine receptors on cancer cells. These probes could therefore both help to elucidate the role of dopamine receptors in the pathogenesis of cancers and offer a potential diagnostic tool for the early screening of cancers. Importantly, the metal-based probes avoid the problems of poor photostability and photobleaching that limit conventional fluorescent imaging dyes. The research project entitled "Cell imaging of dopamine receptor using agonist labeling iridium(III) complex" was led by Dr Edmond Ma of HKBU together with Professor Leung Chung-hang of the Institute of Chinese Medical Sciences, University of Macau. Other collaborators of the project included researchers from the School of Chinese Medicine of HKBU, the City University of Hong Kong, University of Florida, USA, and Hunan University, China. Dr Ma said, "Early detection is crucial for improving the survival rate of hard-to-treat cancers such as lung cancer, which is associated with dopamine receptor expression. For instance, data from the American Cancer Society shows that patients with early stage non-small cell lung cancer (NSCLC) have a five-year survival rate of about 92%, but this drops to only about 36% when the cancer has progressed to an advanced stage. We therefore believe that these dopamine receptor probes show great promise for the development of molecular diagnostic tools for the early detection of cancer." 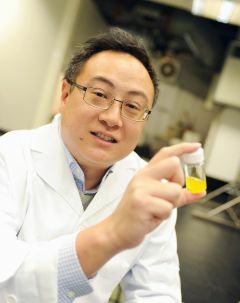 Dr Edmond Ma Dik-lung, Associate Professor, Department of Chemistry, Hong Kong Baptist University (HKBU), has developed the world's first metal-based probes for imaging dopamine receptor in living cells.